From Verso of Photograph: "Mrs. Hillerman, 709 N. W 9th Str, Oklahoma City, Feb. 9, '40, Alsace. I was having a bad case of stage fright just then. I borrowed these fairly clean pants from 'Faht' Burrell and the Gas Mask from Kossow. Check the size of the shoe pairs. I've got one. There's three pairs of ski socks as well as my feet in them. I've lost all my love for words like those behind me. They can be most unpleasant at times." From Seldom Disappointed: "A rainy February 9, 1945, Hillerman receiving Silver Star from Gen. Anthony McAuliffe. The general had just become famous for his one-word ('Nuts!') response to German demands that he surrender his forces in Bastogne during the Battle of the Bulge. Unknown to the general, the soldier he was decorating was Absent Without Leave, having slipped away from the armt hospital at Saverne the previous day to rejoin his platoon." 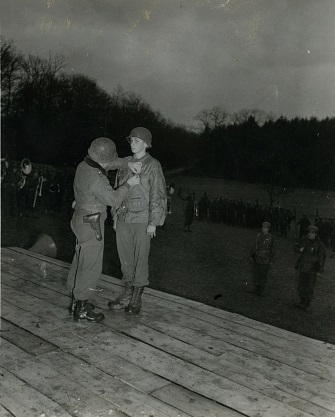 From Kilroy Was There: A GI's War in Photographs: ""Anthony General McAuliffe pins the Silver Star on 19-year-old Pvt. Tony Hillerman, December 1944."